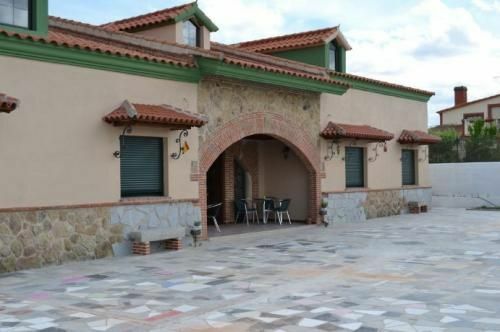 It is a 4 star rural house at the entrance or exit of the town of Castellanos de Villiquera, entrance from the N-630. 8 km from Salamanca and 50 meters from the road to Santiago. GPS coordinates: N 41º03. 330 ', W 5º41. 491 '. It has outdoor barbecue and traditional oven. It is distributed in 11 rooms inspired by the 20s, built with lots of love and with an exquisite delicacy and only 5 minutes from downtown Salamanca. You can enjoy a well-deserved rest without leaving the walks and views of Salamanca, its monuments, its environment and of course its surroundings, charming villages such as La Alberca, Candelario, Ciudad Rodrigo, San Martin del Castañar, Mogarraz, Ledesma and Montemayor of Rio among others. Family treatment, pleasant and direct.